Click on the image to view the post. This blog is about the lesser known but beautiful, wonderful, huge, unique and sometimes bizarre places around the World. Started on January 1, 2009, it is an outcome of my association with Google Earth Community, which I joined on Sept. 29, 2006. Since then I have been regularly flying to almost all the corners of WWW (Whole Wide World) and have virtually adopted the age old motto - Perfect time to see the World is after retirement. Google Earth Community Forum is full of information which ranges from, but not limited to; history, geography, nature, environment, architecture, military, transportation, beliefs, festivals, huge, unique, bizarre items, current happenings etc etc. My favourite section in the Community is "Fun and Games" - in which members post riddles and puzzles on almost all subjects and generally give hints for searching and locating the relevant places and or events on Google Earth. I have made several hundred posts in this forum and must have solved about the same number, though several were beyond my grasp. Believe me it is not easy to solve these riddles - Finding the answer is 90% perspiration (research) and 10% inspiration but it is pure 100% joy and sense of exhilaration. This forum provides a stimulus to my brain and keeps it active. I strongly recommend this for those who have time and penchant for solving puzzles, but a word of warning – it is highly addictive. My travels around the World are not limited to Fun and Games only, however many of the places being covered in this travelogue were found as a result of my researches for making posts in Fun and Games or trying to solve the riddles given therein. To view the Google Earth links given in this travelogue, the "Google Earth" application should be installed in your system. If it is not, then click on following button to get it! All other links can be directly accessed through your browser. A cuckoo clock is basically a clock in which at a fixed duration (normally an hour), one or more cuckoo birds peek out of a small window and call of the common cuckoo is sounded by means of bellows etc. Larger cuckoo clocks also have some figurines which move about alongwith the call of cuckoo. 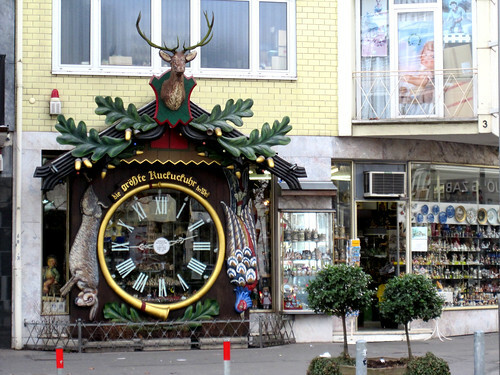 The Black Forest region of Germany is World famous for making these clocks. First clock in the region was built in mid eighteenth century. These clocks usually were made of wood and had the shape of architectural features of the majority of the houses in the area. This tradition has continued even today, though the inside mechanism has changed but the basic design has remained unchanged. 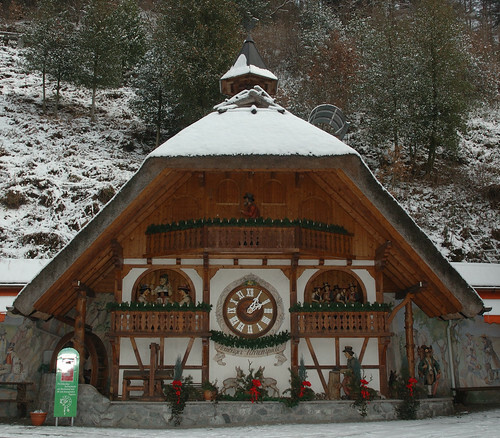 As a part of publicity many large cuckoo clocks were built in Germany and later in other parts of the World. 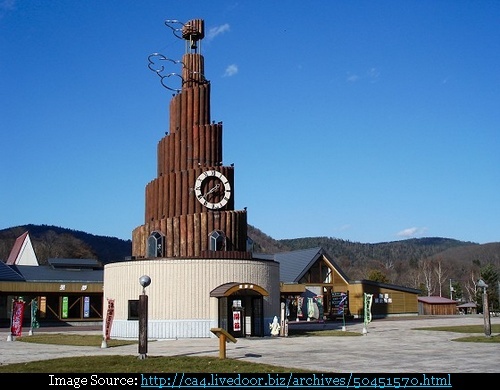 In this post I have tried to locate large cuckoo clocks around the World, few of which at one time or other had held the record for being the World's largest. There may be more but till now, I have found only above 13. May be my readers can help me expand this list. 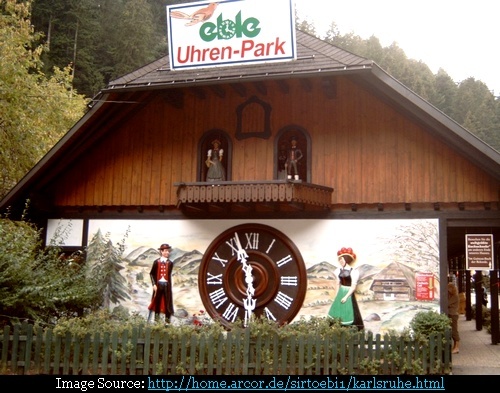 World's biggest cuckoo clock is reportedly at the "Eble Clock Park", Schonachbach, Triberg im Schwarzwald, Germany. It measures 4.50 x 4.50 x 4.50 metres. For the benefit of tourists who cannot wait for the hourly chime and coming out of cuckoos at the strike of the hour, a coin operated cuckoo clock has been provided on the other side of the building. This is World's first Biggest Cuckoo Clock. Made by clock maker Josef Dodd the clock is 3.60 metres long, 3.10 metres high and 1 metre deep. This giant clock located near Best Western Hotel, is one of the largest cuckoo clock in the Black Forest area. This giant clock is part of the family owned producer of cuckoo clocks known as 'House of Black Forest Clocks'. 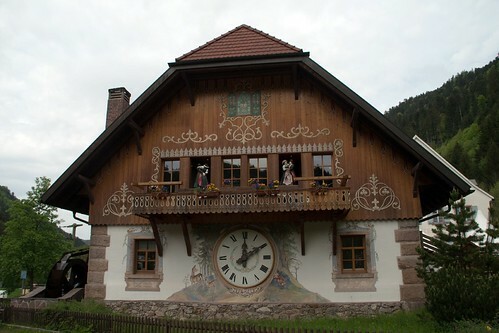 It is also one of the largest cuckoo clock in the Black Forest area. This giant cuckoo clock (whose cuckoo appears every fifteen minutes) was made by the Harz Clock Factory GmbH. At one time (1998) it reportedly was listed in the Guinness Book of Records. Besides the clock, the building also incorporates a giant weather house. With a height of nearly 10 meters it is listed in the Guinness Book of Records as the Largest Weather House in the World. 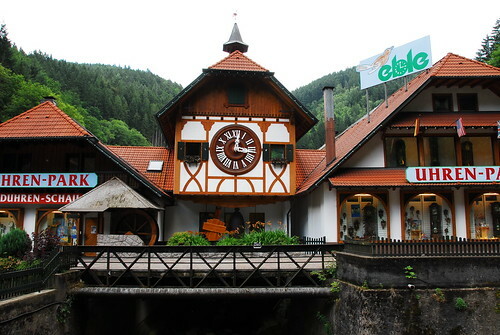 Located at the 'Cuckoo Clock Center' it is reportedly the World's largest free standing cuckoo clock. This Cuckoo Clock was built in the early 1950s and at that time the clock was awarded the title of the "Largest Cuckoo Clock in the World". It strikes every half an hour. Overall height to tip of antlers is 5.25 metres, height of flanking figures is 2.6 metres and diameter of dial face is 2 metres. 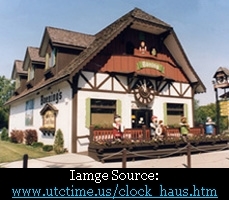 Frankenmuth has a large German population and manufacture of Cuckoo Clocks was started by immigrants from Franconia (now part of Bavaria). 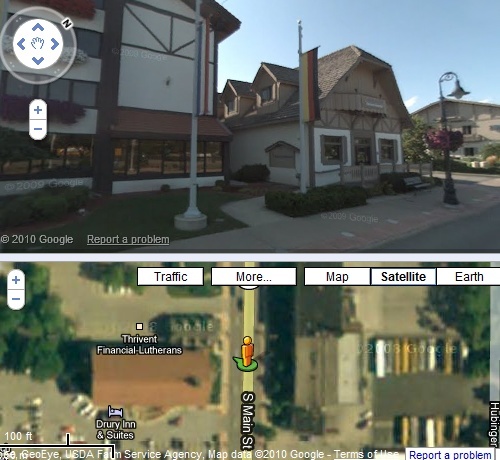 A further search on the Internet shows that presently local office of Thrivent Financial-Lutherans is located in this premises. This is supported by Google Maps and Street View (shown below) and there is no sign of the clock on the facade. Apparently the clock has been dismantled. Unfortunately I couldn't find any information on internet about its fate. This giant clock was originally located in the premises of Grandma's Alpine Homestead (aka Alpine-Alpa) at 1504, US Route 62, Wilmot, OH. Built in 1972-73 as a competition to the Frankenmuth clock (see #8 above) the giant clock is 7.2 metres (23.5 feet) high, 3.3 metres (24 feet) wide and 4.1 metres (13.5 feet) deep. Reportedly it was listed in Guinness Book of Records as well as in Ripley's Believe it or Not. Originally the clock was located on a hillock behind the main building and with passage of time it decayed and stopped working. In August 2007 the clock was renovated and moved from its original location to a new location adjacent to the restaurant. However in 2009 the restaurant was closed and the clock auctioned. It is understood that it will be re-erected at Walnut Creek, or Sugarcreek in Ohio. Exact new location or timetable is not known. Therefore, I have presently palcemarked it at the Grandma's Alpine Homestead in Wilmot. As per comments received from Diana - Sugarcreek Information Center, the giant clock is now on Square of Sugarcreek OH. The Little Switzerland of OH the clock will be running by end of Sept 2012 for their Swiss Festival on Sept 28 & 29, 2012. I will revise the location once I get more info. The clock is now visible in Google Maps as well as in Google Street View. I have revised the location and added its image. This 7 metres high Cuckoo Clock was built in 1958 and was the first of its kind in the South America. The clock was inaugurated on May 25, 1958. The sound mechanism is controlled by an electric motor. A large Cuckoo bird made of wooden polychrome leans to sing the hour and half hour, accompanied by a giant gong. It has now become an icon of tourism in Villa Carlos Paz. Located in Plaza San Martín, the clock is 5 metres high and about 2.1 metres wide. Designed by a local watchmaker the cuckoo clock was built in 1963 (five years after Villa Carlos Paz clock). Located at the roadside station at Onneyu Hot Spring, the clock has an unconventional design as compared to other cuckoo clocks. It has a height of 19.8 metres and every hour, a huge porcelain bird proclaims the time alongwith appearance of fairy tale procession of mechanical dolls. It is claimed to be World's tallest. Credits: I am thankful to kite_surfer, Master Cartographer Google Earth Community (GEC) whose post in the GEC Forum inspired me to search for similar clocks around the World. 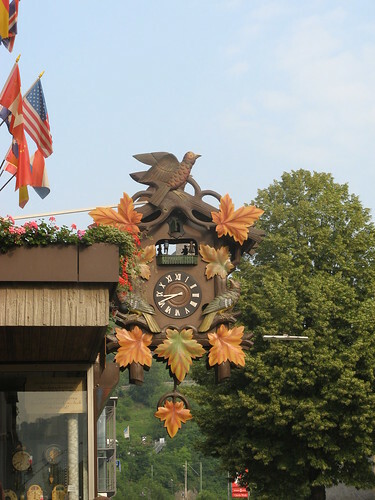 The World's Largest Cuckoo Clock that was at Alpine Alpa ,Wilmot OH is now on Square of Sugarcreek OH The Little Switzerland of OH the clock will be running etc by end of Sept 2012 for our Swiss FestivalSept 28n & 29 Work is being done daily come see. Thank you Diana for the information. Once the clock is up and running please send its pictures and I will be happy to include it here. I am correcting the text in my blog. Please feel free to write your comments but remember that the same are moderated. So please do not post SPAM comments i.e. your business links here including surrogate links. Comments containing SPAM are liable for rejection. This travelogue is not associated, affiliated, endorsed, or sponsored by Google. Photos provided by Flickr / Panoramio / Pbase / Picasaweb / Photobucket etc. are under the copyright of their owners. Screen captured images from Google Earth / Google Maps and Street Views / MSN Bing Aerial Views etc. are under the copyright of their respective owners. Similarly all other photos/images from various other sources are under the copyright of their respective owners, web portals/application etc from which these were obtained. Wherever possible due acknowledgement has been made about the source. Actual terms of copyright/reuse is available in the source link given below each image. The Trojan Horse of Troy is in Turkey! I solicit comments on my posts and also request information/ links to unusual places for inclusion in this travelogue. I will duly acknowledge my source of information. If you are having any problem in opening Google Earth link then please let me know through comment box or e-mail me. I will send the desired kmz/kml file. Read mobile version of this blog by scanning the QR code.